Samurai and Bushi have the same meaning of military nobility of medieval and early-modern Japan. 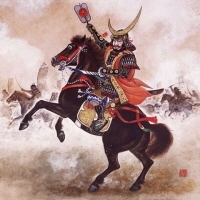 People admired Samurai warriors who were good at both studies and military arts. Today, people hang scrolls whose motifs are Samurai in hope of advancement in lives and good health of children.